When it comes to technology-based start-ups – or any new business, for that matter – disruption is the name of the game. You want to storm an existing market, or creep into the margins and beat others at their own game, securing your own place in the vast ocean that is the modern start-up landscape. For some, it’s enough simply to cruise the waves and keep your head above the water. But for Keovisouk Dalasane, treading water will never be enough. His rapidly growing jobs website, 108 Jobs, may have arrived on the Lao market at just the right time, with the rise of the internet and the subsequent weakening of the print classifieds, but for Keo, this is all the more reason to stay on the alert for the constant threat of disruption. And so the website – an easy-to-navigate, constantly updated list of employment vacancies in Laos – comes with a magazine of the same name, and now, an app to appeal to the many people who search the job market from their phones. Keo has always had an eye to the future. Raised in Vientiane, he finished his schooling there, before heading overseas to study. In Thailand, he studied human resources, never imagining that two decades on, he would have a grip on the Vientiane employment market via his own start-up. He went on to study economics in Japan, where he started a PhD and decided, after envisaging his future post-doctorate, that he didn’t like what he saw, and dropped out in his third year. But he’s adamant that his failure to finish has never been a problem. “That’s one thing maybe I want to share with people. It doesn’t mean I spent two and a half years as a waste. I myself actually value the process a lot, not the end result,” he says. “In between, you see what you learn, the journey is more important, and I learned a lot. I might not make it to a degree, but then all those things are still with me. How you analyse things, how you see things differently.” By the time he returned to Vientiane in 2009, he was ready to settle down, start a family and find a niche ripe for a start-up enterprise. 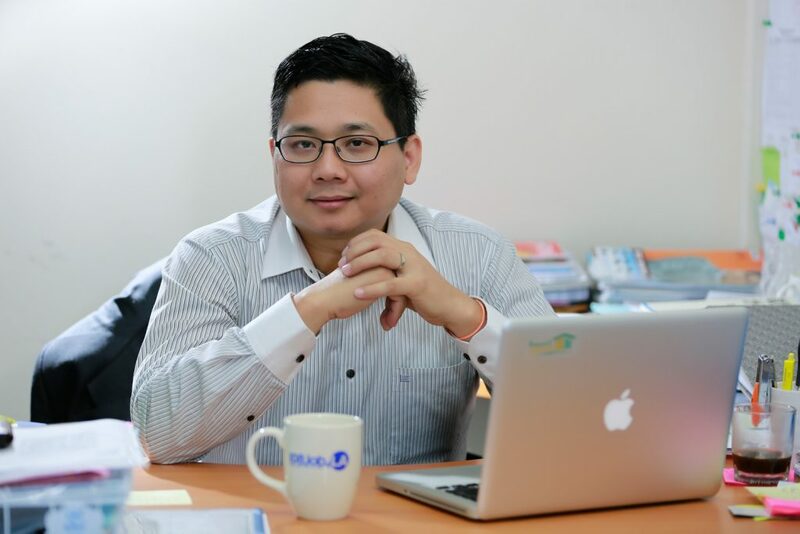 Although the internet was still relatively new in Laos, he knew from his experience overseas that the sector would grow rapidly, and that internet-based services had the potential to turn a profit if the timing was right. And so, in 2012, 108 Jobs was born – so named for the Lao expression meaning “tons of jobs”. “We decided to launch a website at that time, but we decided also to make it a little bit different from other websites, by launching together with a magazine,” he says. There were other online job sites at the time, but 108 soon surged ahead, taking just two and a half years to become a success. The new app was, to him, a logical step along the way, tapping into the multitudes of people who not only live their daily lives through their phones, but also value the catchiness and cache of a cool new app. But 108 Jobs goes beyond just appearances. Behind the user-friendly façade is a busy network of contacts and all kind of synergies when it comes to the employment market. 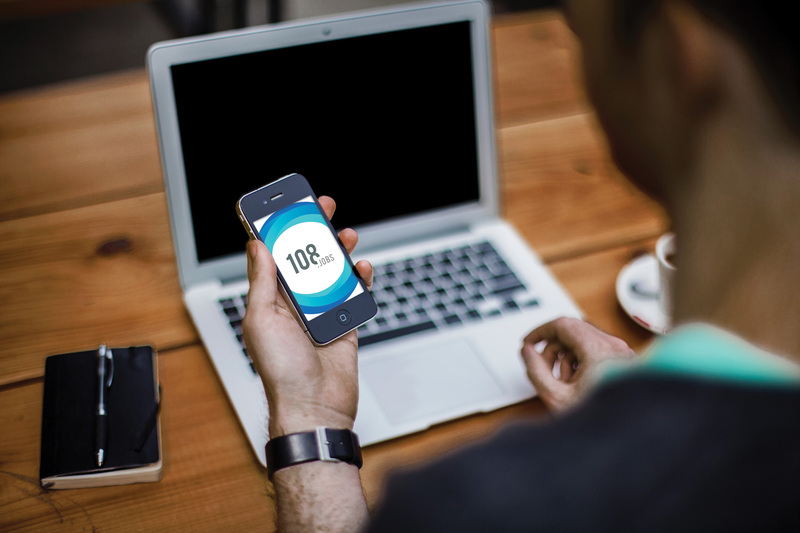 “We have customer lists, we have customer relationships, so what we do is we offer them whatever they need within the space of HR, not only job ads,” he says. Keo has also launched a companion website, Job Jib-Jib, aimed at the high-turnover hospitality sector and job-seekers wanting short-term employment. The team has also developed a restaurant- listing website, Spoon.la, and the synergies with 108 Jobs is obvious, while the name of the magazine has recently changed to just 108 Magazine, allowing it to spread beyond just the hospitality sector. “The reason I am doing a lot of all this, I think, is we are in a very innovative space,” he says. So, while riding each new wave might look easy to an outsider, Keo says it’s important not to get too comfortable up there. “We’re always on the top of the wave and seeing what’s coming,” he says.